1- Breathe. Take a few minutes and breathe deeply in and out through the nose. 2- Go for a brisk walk. Five minutes of fresh air and some vitamin D can really help settle the nerves. 3- Close your eyes and imagine the most beautiful place on Earth. Be there for five minutes… wade into the water, walk along the beach, bask in the sunshine that your mind creates. 4- Read. Whether it’s a book or a magazine, the mental escape is wonderful. 5- Blow some bubbles. This can be such a relaxing activity! 6- Pray. A few moments in prayer often helps to calm the nerves. 7- Meditate on scripture. My favourite calming scriptures are: John 14: 27; Matthew 11: 28-30; and Psalm 23. 8- Laugh. Think of the funniest thing ever and laugh out loud. Can’t laugh on cue? Keep some comic strips on hand for such an occasion. 9- Give yourself a massage. Massage your hands, feet, or temples and scalp. These 11 self-massage tips are especially helpful. 10- Have a cup of herbal tea. I find the best herbal tea to calm the nerves and mind is chamomile tea. 11- Do some calming yoga poses. One of my favourites is viparita karani (legs up the wall pose). The pose is pictured here. I remember unintentionally doing this pose when I was a child. I still find it to be calming. You can also do child’s pose, which is pictured here. 12- Do some toe exercises. Take off your socks and look at your toes. Ball your toes up as tight as you can. Now release them. Do this a few times then try to spread your toes far apart; release and repeat a few more times. Breathe deeply while performing this exercise. 13- Stop and smell the flowers (or at least look at some plants). Research shows that flowers and plants have a positive effect on mood and well being. 14- Listen to some calming music. There are many meditation and relaxation CDs available. Find the ones which work for you. 15- Close your eyes and daydream for a few minutes. 17- Get out a notepad and doodle. 18- Do some reflective journaling. 19- Sit outside and do some deep breathing. 20- Light a candle and watch it flicker. 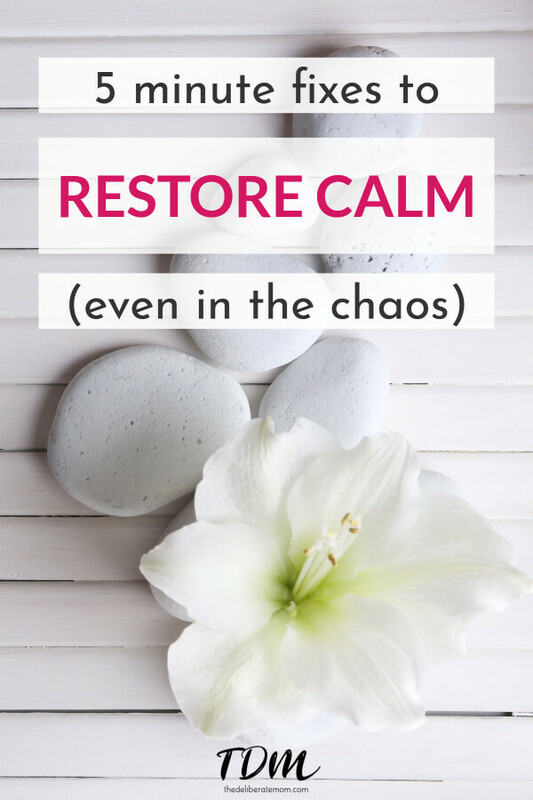 Every busy mom can take five minutes to calm their minds and bodies. Try some of these strategies out. I’m certain many of these five-minute quick fixes will help you find your inner calm. So many great suggestions. Breathing is so important! Whenever I feel overwhelmed I try to focus on one of my personal mantras: remember to breathe. I repeat it in my head slowly and gently while taking a few deep breaths. I then center my attention on lowering my shoulders. Sounds odd but I know my shoulders slowly creep up towards my ears especially when I am stressed. By consciously dropping them down (gently while breathing) I can feel my whole body becoming less tight and tense.